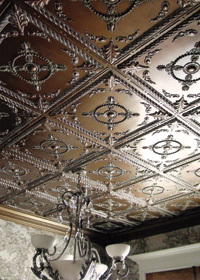 You're thinking about some new ceiling tiles and you like the look and price of our vinyl ceiling tiles, but you've got a few questions. It just so happens that we've got answers! 1. Why Are PVC Tiles So Thin? The real question should be, "Why are mineral fiber tiles so thick?" Hint: It's because they can't make them any other way. 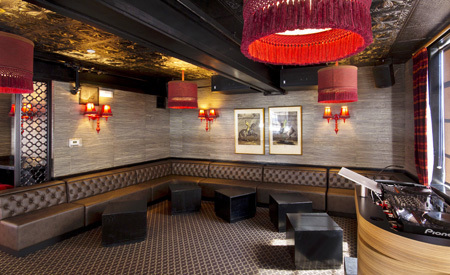 Ceilume puts beauty in your ceiling, not bulk. 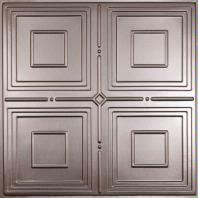 You care about how good your ceiling looks, not how thick it is, and nothing looks better than Ceilume in your ceiling! 2. Will These Ceiling Tiles Support Can Lights? Nope, but no suspended ceiling panel should ever support recessed lights because none are engineered to do so. That being said, Ceilume works great with can lights; just use a standard recessed light bracket (which supports the weight of the tile on the grid) and you're good to go. And, oh yeah, Ceilume is much easier (and less messy!) to trim and install. Check out the How to Install Can Lights video to learn more. 3. Will My Tiles Look Funny at the Borders? Top designers sure don't think so (check out the gallery section of our website), and we offer great choices in border tiles. The truth is, most ceilings look boring everywhere. 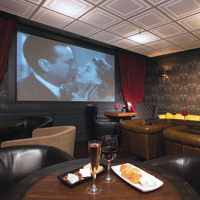 Ceilume gives you plenty of ways to turn that boring fifth wall into a beautiful one! 4. 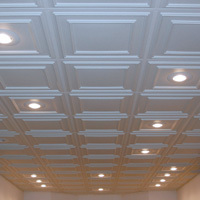 PVC Ceiling Tiles Are Really Light; Will They Lift and Flutter in the Grid? Lift and flutter has very little to do with how heavy a tile is and everything to do with where it is installed, which is why the big mineral fiber guys all make uplift prevention clips available for their heavy tiles. Lift and flutter is a function of rapid air pressure changes in a room, and most rooms don't have that problem. If yours does, we've got uplift prevention clips available, no problem. And we'll share a secret... we actually sell clips made by one of the big mineral fiber guys! 5. My Contractor Just Told Me He's Never Worked with Ceilume. What Do I Do? Tell him to give us a call at 1-800-557-0654 and get some samples. Then ask him to install some. 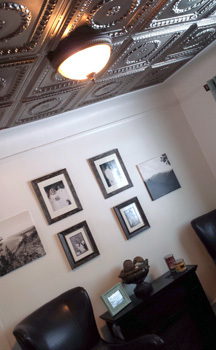 Once he sees how easy and clean they are to work with, he'll never want to use those old ceiling panels again. We believe that a healthy home is a happy home, and that's why we offer our ceiling tiles in Rigid PVC, a material that's been GREENGUARD Gold Certified for indoor air quality, which considers safety factors to account for sensitive individuals (such as children and the elderly), and ensures that a product is acceptable for use in environments such as schools and healthcare facilities. 7. What About PVC? Isn't It Dangerous? Polyvinyl chloride, or PVC for short, is a plastic that has been subject to rigorous debate in the last 20 years or so. More now than ever, both sides of the debate have become harshly polarized and compromise seems far from reality. PVC plastic is the second largest volume produced plastic in the world today. It is manufactured worldwide, producing billions of pounds of resin yearly. The material is very versatile, and is used predominantly in construction, but also in food packaging, household items, automobiles, and even children's toys. It is because of this wide range of uses that it has become so hard for anyone to agree on anything. On the other side of this debate, industry representatives and proponents for PVC feel that their plastic of choice has received a bad rap. Understandably, their support is many times inspired by their jobs in the industry. People that work with and around PVC tend to find the plastic very non-threatening. It is also the livelihood of millions of people worldwide, from the manufacturers of the plastic to the retailers of PVC-based products. Because of their integration into the PVC industry, these folks tend to take the defense, having to thwart attacks by environmental activists on their source of income. These folks feel very differently about the issues surrounding PVC. Chlorine is indeed a dangerous chemical, but it is a chemical used by many different industries. There are relatively very few deaths or injuries relating to Chlorine exposure versus many other materials and chemicals. Proponents of PVC ask people to consider car accidents, gasoline and oil fires, and many other chemical accidents in manufacturing facilities world wide. Chlorine for the manufacture of PVC is no worse for us than gasoline or bug spray. Accidents happen, but they are few and far between. The science surrounding plasticizers in PVC is by no means conclusive, and is based highly on studies of animals with little relation to humans. While this is sound science, the results are often portrayed in whatever fashion is necessary to promote the agenda in question. PVC advocates and industry representatives often point this out in a effort to prevent the public from jumping to conclusions. Unfortunately, in an argument such as this one, there is no fact or proof that can clearly be referenced to clear things up. When PVC is plasticized, it does become hard to recycle. However, PVC fans like to point out that heavily plasticized PVC is not nearly as common as rigid, or unplasticized PVC. Rigid PVC contains very few to no plasticizers, and very few additives at all. This type of PVC is very easy to recycle, and many companies will even BUY it to process and resell. Rigid PVC is most used in construction materials, which are the number one end-use for PVC in any form. Several countries in Europe have even adopted a new classification of PVC, called uPVC (short for unplasticized polyvinyl chloride), to distinguish between heavily plasticized, and in may cases banned PVC products, and their much easier to recycle cousin of the unplasticized variety. On one side of the debate, there is a growing list of ecologically-minded groups and individuals that believe that PVC is the most dangerous plastic (and, in fact, the most dangerous synthetic material) widely available to the public. There are many good reasons for this. First of all, polyvinyl chloride is made from chlorine, a very dangerous chemical when not controlled properly. There have been some accidents in PVC manufacturing facilities that have sickened the local population, and even left an unfortunate few terminally ill. These injuries and illnesses are predominantly based around an accidental release of chlorine. Second, while PVC is a very versatile plastic, it sometimes requires additives to give it certain desired characteristics. For instance, to soften PVC for use in shower curtains and food packaging, special chemicals named phthalates must be added. These chemicals allow the PVC to bend and remain soft, but there is quite a bit of controversy regarding their possible effects on human health. Third, many people believe PVC is non-recyclable, and will in fact contaminate good batches of recyclable plastic when improperly disposed of. This can be true, when enough plasticizers and additives are used in the manufacture of a PVC based product. Plasticizers and other additives can constitute up to 60% of a softened PVC product, making for a very impure plastic. This impure plastic can cause havoc in some forms of recycling, so PVC needs to be disposed of responsibly. There are always two sides to every argument, and the PVC debate is no different. PVC can be a boon or a bane, depending on its use. However, it is important to distinguish between what is fact and what is speculation, so that people can make good choices about the materials they use. Should the US ban PVC altogether? Probably not. It has many good uses and few effective substitutes. Should we allow the unchecked use of questionable materials and chemicals? Of course not. But somewhere in between these two options is a compromise that will allow us to utilize the benefits of this versatile material and keep our children, ourselves, and our environment safe. Most importantly, do your own research and make educated decisions!